Gartner has identified the drivers for the adoption of SaaS and cloud offerings for BI, analytics and performance management. Nearly one-third of organisations either already use or plan to use cloud or software-as-a-service (SaaS) offerings to augment their core business intelligence (BI) functions, according to a report from IT research firm Gartner. According to a survey of 1,364 IT managers and business users of BI platforms in the fourth quarter of 2011, only 17 percent of organisations have replaced or plan to replace parts of their core BI functions with cloud or SaaS offerings. However, almost a third (27 percent) already use, or plan to use, cloud or SaaS options to augment their BI capabilities for specific lines of business or subject areas in the next 12 months. Enterprises are adopting two types of cloud. One is less risky but inherently flawed. The other offers greater rewards but very few so far have succeeded with it. There’s a huge variety of different definitions of cloud floating around. Some are just plain wrong, while others are only valid in specific circumstances — cloud strategies that are right for certain organisations at certain times aren’t necessarily right for others (or even for the same organisation later on in its evolution). It’s tough for any enterprise decision-maker to figure out the right path. Most times, you won’t even know it’s there. But then, that is the beauty of cloud computing – you just concentrate on your core competency and stop worrying about the operating system, the traffic your IT system or website faces or about resources lying waste. This is especially true for a place and market such as India, where the IT literacy is low, but growing. How companies will manage to leverage the numbers to their advantage is the question. Not just that, start-ups and smaller companies also stand to gain through cloud computing since it helps them do away with a significant amount of investments on IT infrastructure and resources. Social media platforms are a subset of a larger category of applications referred to as cloud computing. Cloud computing encompasses various platforms that users can access over the Internet, in which the storage of data is diffused across a potentially large number of sites. Examples of cloud computing include free web-based applications like email accounts and document sharing provided by Google, as well as more complex cloud computing systems that are used by companies who are looking to reduce IT management and maintenance costs by using third-party service providers. Cloud computing did not see a landslide of adoption in 2011, but concrete examples of cloud in action are now abundant. 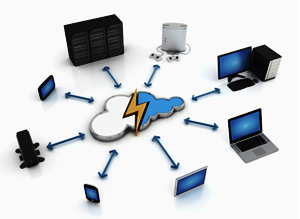 Cloud computing has unquestionably been the most discussed topic in the IT sector during the past few years. By the start of 2011, IT professionals were beginning to wonder where the concrete examples of cloud supposed benefits were. Unfortunately, cloud computing is such a vague term that covers such a broad range of services and systems that satisfactorily tracking adoption can be difficult. The analyst companies all continued to predict steep adoption curves in future. In May, for example, Forrester Research predicted that the global cloud computing market will grow from an estimated $40.7 billion in 2011 to $241 billion in 2020. We hope these short sum-ups on Cloud Computing in 2012 helped you to take a more knowledgeable approach towards moving to the cloud. Stay tuned for more sum-ups on in the forthcoming year.